Recently, our family have been having lots of fun making food-safe silicone moulds for chocolate and fondant. When we show 3D printers to children at events and school visits we usually get a question about whether it can print chocolate. 3D chocolate printers do exist, but we don't have one (though it is tempting!) But we can make custom chocolate shapes using our 3D printer. We've made lots of these moulds now. The photos in this article use an Easter bunny model that my son created and a House of Stark Sigil model from Thingiverse. Note: We don't let our kids watch Game of Thrones. 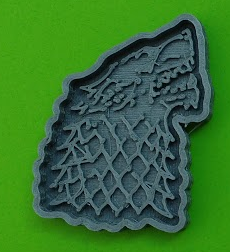 But we do let them eat House Stark Sigil chocolates! Find or create a 3D model in the shape that you want the chocolates to be. Use the mould master OpenSCAD library to create a mould master from your 3D model. 3D print your mould master. Use food-safe silicone to make a mould from the master and allow the mould to harden. Pour melted chocolate into the mould and wait for it to set. Shapeasy exports .stl file via email so that part was easy. You'll need a recent version of OpenSCAD installed for the next part. We mostly work on Linux, but OpenSCAD is also available for Windows and Mac. Mould master creates a 3D printable mould master model by adding a container around a model in the shape that you want to chocolates to be. You can pour silicone into the 3D printed master to make a mould. Put mould-master.scad from mould master OpenSCAD library in the same directory as your .stl file, bunny.stl in our case. Create a new project in the same directory and use the mould-master library as shown. Preview the design to make sure it works. When you're ready you can export your model as a.stl. You can do much fancier things if you know how to work with OpenSCAD (as we did with the double bunny mould), but we'll just stick to the simple case here. The time the mould takes to cure will depend on the temperature. For our particular silicone it took a couple of days during winter, but should be a few hours on a warm day and much less if you heat the silicone first. If you want multiples of the same mould then you can reuse the 3D printed mould master. Melt chocolate in a microwave or over a pan of boiling water. You can use cooking chocolate but we've just used regular chocolate. The pour the chocolate carefully into the moulds. Tap the moulds a little to try and remove any bubbles. Then leave the chocolates to set in the fridge. We've found that they come out of the moulds easily as the silicone is very flexible.